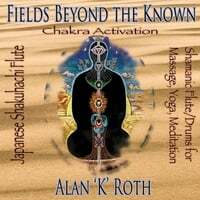 "Fields Beyond the Known- A Shaman's Tale"
K. Thomas - Music, Film & TV Producer, Musician, Emmy Award winner, Oscar Nominee. Kit Thomas - Music, Film & TV Producer, Musician, Emmy Award winner, Oscar Nominee. "Fields Beyond the Known は、素晴らしい瞑想です。アランKの多次元の詩は間違いなくあなたを虜にし、楽しませることでしょう。"